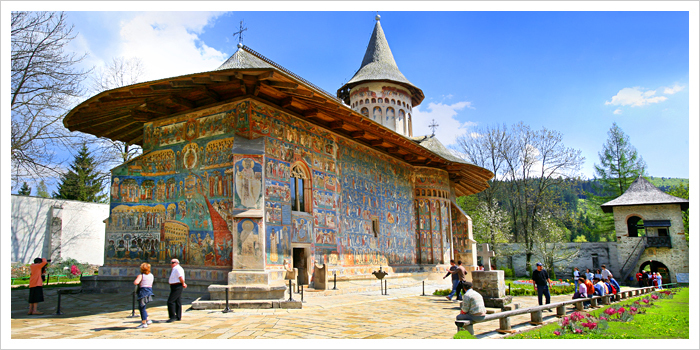 WHEN the Moldavian prince Stephen the Great won his first decisive victory against the Turks five and a quarter centuries ago, he decided to mark the occasion with a grand monastery and adorn its walls with the colorful work of artisans of the day. With his second victory came another monastery. With the third, yet another. to 1488, and the reign of Stephen the Great. The result of his victories — 46 in all — was an unprecedented building spree within the densely forested terrain of the Bucovina region in modern Romania. The tradition was embraced by his son and successor, Petru Rares, and their vassals. Many of the mural-covered monasteries and churches survive, nestled in a valley, having withstood the withering summer sun and winter winds for centuries. What started out as Stephen the Great's war trophies have become some of the world's most stunning works of art. They exist now as the present-day Monastery of Voronet, about three miles south of the Romanian village of Gura Humorului, and its sister sanctuaries, scattered within a radius of some 25 miles and collectively recognized as Unesco World Heritage sites. Pinpointing the area that contains this trove is not easy. The region, which became the eastern outpost of the Austro-Hungarian Empire, is now divided between southern Bucovina, in northeastern Romania, and Chernivtsi Province, in present-day Ukraine. To further complicate matters, some Romanians also refer to it as northern Moldavia, not to be confused with the independent Republic of Moldova, which borders northeastern Romania. But there is good reason to make the trek, geographic confusion and pothole-pocked roads notwithstanding, as I did last summer. Driving through Prislop Pass on the northern slopes of the Carpathian Mountains in Romania's Muntii Rodnei National Park, I caught my first glimpse of the area, a dizzying green expanse thick with virgin forests. The trees gave no clue of the treasure they hid. I had chosen a room at Casa Felicia, a guesthouse next to a monastery in the village of Sucevita, as my base. From there I embarked on a self-guided tour of the monasteries and their murals. Architectural historians have described the monastery churches, some shaped like gnomes in slouch hats, as Byzantine churches built with Gothic hands. At the monastery church of Voronet, I found that no labels do justice to the images that ring the exterior. Like an open picture book, its pages fluttering in the breeze, every surface is covered with tableaux from the Old and New Testaments as well as local legends and the lives of saints. Voronet remained a monastery until the 18th century, when Hapsburg occupiers chased out the monks, and was uninhabited thereafter until 1991, when a community of nuns dedicated to the Order of St. George took up residence. There are regular tours, though mostly in Romanian. During my visit, one unsmiling sister of indeterminate age and a certain severity gave a clipped tour in English. "Questions, no!" she half-challenged, half-threatened at regular intervals, brandishing a pointer that might have doubled as a switch; no one dared raise a hand. But you don't have to speak Romanian to grasp the meaning of these painted parables. The famous "Voronet blue" base of the color scheme, obtained from crushed lapis lazuli, has an overpowering effect, as if the sky had descended to saturate the surface. Byzantine-inspired scenes, astoundingly expressive, illustrate the Book of Genesis on the northern wall, and include a bewildered-looking Eve, fresh-formed from Adam's rib. A soaring, azure Tree of Jesse climbs the southern wall, tracing Jesus' terrestrial genealogy back to King David, framed by a ring of classical philosophers. In juxtaposing Old and New Testament themes with portrayals of Greek philosophers, the painting strongly affirms a cultural affiliation with the Occidental tradition, as distinct from the tradition of the Ottoman invaders. Built in 1488, at a time of relative peace, the walled monastery doubled as a military stronghold, just in case. Its frescoes were painted a half-century later, mostly by anonymous masters, except for a certain Marcu, who inscribed his name to the left of the entrance. 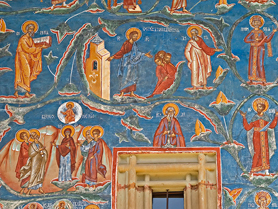 The images in this and other Bucovina monasteries were intended to instruct, entertain and enlighten illiterate soldiers and peasants and to underline their loyalties. spiritual adviser to Stephen the Great. The cave of Daniel the Hermit, spiritual adviser to Stephen the Great. The sprawling Last Judgment, known as the "Sistine Chapel of the East," covers the entire western wall and hammers home the message. Moses strives to lead the call to salvation at the throne of Christ Pantocrator (Christ Almighty), while the skeptical Jews linger among the Turks and Tatars, waiting to tumble into hell. It's a frightening, albeit fabulously entertaining, epic depiction, the D. W. Griffith silent-screen extravaganza of its day. In the Monastery of Humor, in the village of Manastirea Humorului, about four miles to the north, the dominant hue of the exterior frescoes is a madder-based brownish red that enhances the church's allure, as if it were a giant magic mushroom sprouting from the earth. Built in 1530 on the site of the ruins of an older monastery, by the nobleman Teodor Bubuiog, a faithful vassal of Stephen the Great and Petru Rares, Humor has exterior frescoes, not as well preserved but similar in style and motif to those at Voronet, painted in 1535 by Toma of Suceava. Cristian Movila for New York Times. Plundered by the Cossacks and other invaders and closed by the Hapsburgs, Humor, like Voronet, was re-established as a monastic community in 1991. The ramparts are still intact. I climbed the stairs of the watchtower for a glimpse of the church huddled within and a sweeping view of the hills without. The sulfur-based yellow background lends a sun-drenched appearance to the church in the Monastery of Moldovita, built in 1532 by Petru Rares in the village of Vatra Moldovitei, some 20 miles to the west. Its anonymously painted exterior frescoes of varying styles, indicating the likelihood of multiple artists, date from 1537. A pointed history lesson and warning to the faithful on the south facade depicts the 1453 Turkish siege of Christian Constantinople, and is among the most dramatic outdoor paintings in the region. As I focused with a childish delight on the battle scene, a spectacle of mounted soldiers amassed around the fortified city, I was roused from my decidedly secular reverie by a passing nun who seemed to see right through me, striking a toaca, or prayer board, used here in lieu of a bell. Romanians flock to the Monastery of Putna, not far to the north, to worship at the tomb of Stephen the Great, canonized as The Right-Believing Voivod (prince) Stephen the Great and the Holy by the Romanian Orthodox Church. He had the structure erected from 1466 to 1469 as his final resting place. Ransacked by Cossacks, the church was rebuilt from 1653 to 1662. The outer walls are bare, lending it an austerity unlike the spiritual lyricism of its sister sanctuaries. Stephen likewise had a hand in preserving the beautiful Biserica Dragos Voda, said to be Romania's oldest standing wooden church, built in 1346. It was moved, beam by beam, in 1468 to a less-visible location, behind a graveyard just outside the monastery walls, to protect it from the marauding Tatars. My heart did not beat faster at Stephen's sepulcher, but nearby it leapt at the primal allure of Chilia lui Daniil Sihastrul, the cave of the prince's spiritual adviser, the ascetic mystic Daniel the Hermit, which he carved out of the cliff and inhabited for 14 years. Perhaps it was the lingering effect of the homemade palinca, the twice-distilled, 60-proof plum brandy that Trandafir and Felicia Cazac served at supper at their guesthouse, Casa Felicia. After a few days of monastery hopping, my spiritual faculty was primed. I could not help but be stirred by the stark contrast between the harmonious phalanx of angels hovering in rows above and the chaos of the damned below in the surreal depiction of "The Ladder of Virtues" on the northern facade of the Sucevita Monastery, next to the guesthouse. I stared at my photograph of it long after supper. Though visitors are supposed to identify with the virtuous, my gaze was riveted on the tormented tumble of the demons and the damned. Given the grim history of the 20th century, this Bosch-like scene seemed eerily prescient. Pondering the titles, including "Mohn und Gedächtnis" ("Poppy and Memory") by Paul Celan, a poet of Bucovina, I thought of "The Ladder of Virtues" and those who didn't survive the climb. Tarom, the Romanian airline (tarom.ro), flies to Iasi, in Bucovina, from Bucharest. An online search found fares from $159 in July. Or you can travel by train (cfr.ro) to Iasi from Gara de Nord in Bucharest.